Read Holiday Party and Carnival Basics for general overview of the what, how and why of festive Jewish programs for kids. Planning a small party or huge carnival for Hanukkah? Find stations on this page. Pick the ones that will fit your venue, guest list and age ranges best. Also, see my Hanukkah Carnival Station post with more photos (from the most recent blow-out carnival at shul.) PHOTOS AT BOTTOM OF THIS PAGE, TOO. Also, my Maccabee Oil Crush Program can be the centerpiece of a carnival or the focus of an oil-centric mitzvah fair. See details and pics for that here. It’s nice to have a home-grown alternative to franchised missionary workshops. When I helped plan my first big Hanukkah Carnival, I trawled the Web looking for detailed plans. I expected oodles of overviews documented with step-by-step instructions. After all, Hanukkah is the most visible Jewish holiday and one of the most “observed” party-wise, even among non-Jews. But I found bupkes. So I made one. Below is a list of possible stations for Hanukkah Carnivals, with brief annotations. Stations specifically for young children are designated first, but even these can usually be adapted for older kids. Likewise, vice-versa. Each station can have prizes ready to distribute to kids who complete the task. See Prizes below for suggestions. • Swim Noodle Menorah: tutorial here. Good for teaching the order of candle placement and blessing practice. • Fishing for Dreidels: Wooden Dowels, cotton twine or yarn, metal washers, mini wood dreidels, magnets. Tie string to end of dowel (hot glue to anchor it better), tie Ring Magnet to other end. Figure out what size of flat metal washer will fit snugly around stem of dreidel, then glue with Epoxy. If the magnet is heavy enough, child can fish by moving it around the bottom of the “pool” and attract a washer on a dreidel. • Sand Pit Dreidels: Fill a 66 qt. plastic bin (or bigger) with Play Sand. Bury big dreidels. Keep track of how many are buried. Offer prize if player finds one or all. The beauty part of a plastic bin is that it has a lid and can be easily stored for next year. • Make a Hanukkah Card: provide stickers, crayons, markers, rubber stamps, paper and examples of how to spell Hanukkah in English and Hebrew. • Hanukkah Play-dough: LOW table (so kids can stand and work) with playdough and Hanukkah shape cookie cutters. (RiteLite makes a set.) Add tiny rolling pins (or shortish lengths of PVC pipe at least 1″ diameter). Add basket of short lengths of drinking straws or wooden pegs or candles so kids can form 3-D menorahs, add “candles” and “light” them! Be sure to include a real model for reference. • Edible Menorah in the Window picture/snack: see lesson plan here. Menorah rules, pretzel sticks, gumdrops and construction paper. • Dreidel Arena (a Train Table is perfect, but big trays with raised sides are fine) Use large wooden dreidels to avoid choking hazards. Display game rules in case older kids or adults want to play. My printable cheat sheet is here. • Puzzle & Lacing Area: Wooden Hanukkah puzzles, KidKraft Hanukkah play set (this is gorgeous, have you seen it? ), Hanukkah Lacing Boards with thick shoestrings. Put each on a tray to define space and keep orderly. No one wants to play with a puzzle scattered all over the floor. • Build the Temple with Duplos: Ideally, a train table (low, with sides to contain bricks) filled with Duplos. Post a picture book illustration of the Temple from a Hanukkah story, and keep book at station (because you might end up reading the story aloud, which is awesome). This is an excuse for relaxed, free-build and will attract little builders who might be overwhelmed with other types of stations. Ideally, add a tiny metal menorah (7 branched as per story) to build around. •Pin the Shamash on the Menorah: I use a big poster from Rite Lite, tape it to foam core board and put on an easel. “Shamash” is a golden gift bow with adhesive on the back, supplemented with a wad of blue tape. Bandana to hide eyes, or a party mask with two Hanukkah stickers to cover eye holes. • Decorate goody bag (see PRIZES below): markers, crayons, stickers, etc. 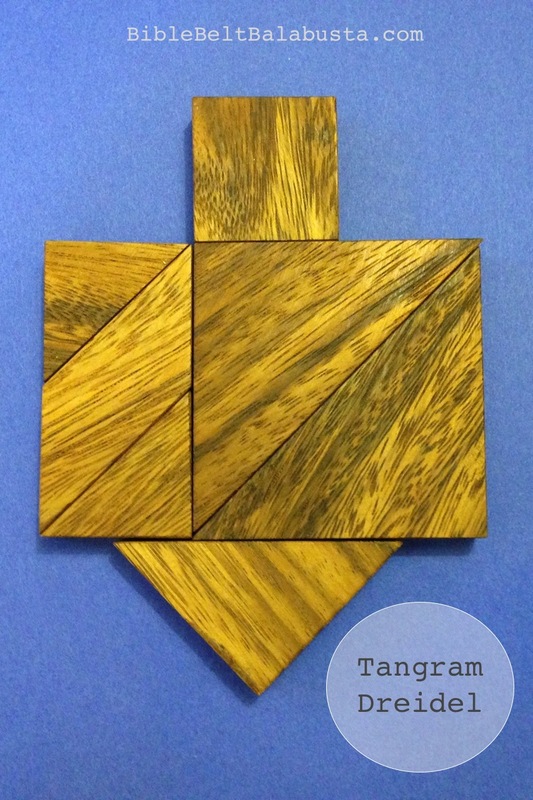 • LEGO Dreidel Make and Take: see tutorial here, with advice about ordering parts in bulk. Print the how-to and post it on a lucite holder so builders can see what to do at a glance. Provide blank Avery labels so kids can write or stamp letters and apply in proper order. • K’NEX Dreidel Make and Take: see tutorial and carnival prep advice here. • Sufganiyah on a String: the hands-free-doughnut-on-a-string-game renamed for the traditional Hanukkah treat (jelly doughnut). Ring doughnuts work best, of course, tied onto a string hanging from a frame near a serving table. If you have a crowd, go ahead and tie a few in advance, then slide them down as players finish. The prize for this game is getting to eat the donut! • Dreidel Arena: big serving trays on tables. Two people can play on one tray (they stand on opposite sides of the table with tray in between). Display dreidel game rules prominently! Here’s my printable with letter names, Hebrew word, transliteration and game actions. I use lucite holders to prop them up at the little kid table and the big kid table. I add signs reminding kids to compete for: speed, endurance, and spinning upside down. 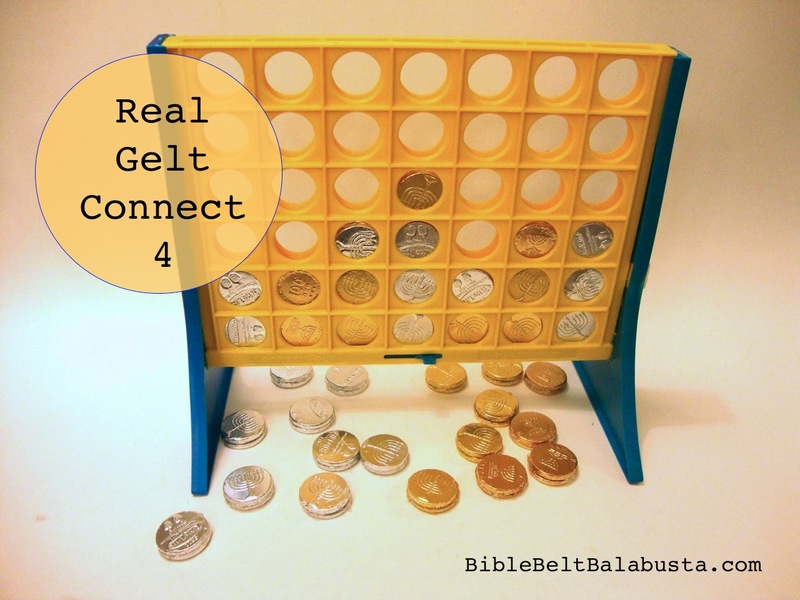 • Connect-4, the Gelt Edition: convert a Connect 4 gameboard to use silver and gold gelt instead of red and black checkers. Depending on the game frame (they have mutated over the years), you may have to try different brands of gelt or hot glue pieces together to achieve the right thickness. See tutorial here. • Connect-4, Painted Checker Edition: this takes moments where the real Gelt Edition could take hours. Spray paint the pieces of a working Connect-4 set. • Gelt Checkers: Substitute jumbo-size silver and gold gelt for the red and black checkers. See DIY here. • Origami Dreidels: Display model and my directions. Provide paper squares and rubber stamps of the nun, gimmel, hey and shin. Print and display this sheet with letters, name of letters and meaning of letters. • Origami SPINNING Dreidels (more difficult than the flat pattern above). Provide paper squares, models, markers to write letters. Photocopy book reference in my post to show step-by-step instructions. Print and disply this sheet with letters, name of letters and meaning of letters. • Hands-on Kosher Menorah Quiz: sounds boring, but can be awesome. See my post, here. Especially if the chanukiyot are interesting and everyone gets chocolate for voting! • Latke Toss: Toss flat, brown beanbag discs into a big frying pan. Make beanbags from felt and dried beans hot-glued at edges. See “Toss Tips” to assure game fun is maximized! • Flip the Latke: Players try to flip the latke from one side to another without letting latke fall out of pan. I use small plastic frying pans from Target Dollar Spot, but any cheap, small pan will do. Make a latke from one of these materials: wooden disc (basket bases from craft supply houses), flat beanbag, painted cd/dvd, thick cardboard, model magic or anything flattish, round and with enough weight to flip well. Attach disc to string, ribbon or elastic and then tie other end to hole in the pan’s handle. Store pans on table. No need for Toss Tips below. • Squirt the Menorah: Large metal menorah on mat, candles, lighters, towels, squirt guns, large pitcher of water to submerge guns to refill. Yes, the candles will re-light even when wet. See tutorial here. • Menorah Ring Toss: Toss wooden or plastic curtain rings—or light-up bracelets, even if they don’t light up anymore—onto the 9 arms of a large menorah. Menorah can be real or a dummy menorah made of wooden dowels glued into a block base, or even made of cardboard tubes if you are in a big hurry. Tape the menorah to the floor for stability. Rings depend on size of menorah arms. Curtain rings come in wood or metal in various sizes. Extra points for “lighting” in correct order. See “Toss Tips” to assure game fun is maximized! • Edible Dreidels: Older kids and adults like these even better than the preschoolers do. Let them try to paint/write the four Hebrew letters around the marshmallow (edible pen or tiny brush with food coloring). See my tutorial here. • Edible, SPINNING Dreidels, a.k.a. Caramel Dreidels: made with a caramel, pretzel stick and food-safe marker. Provide plastic plates to practice spinning. See my tutorial here. • Tattoo Station: Removable tattoos with Jewish themes. An older kid can apply to the younger ones. • “Maccabee Manicures” Nail Salon: card table with nail polish, remover, cotton balls, paper towels and the adorable Hanukkah nail decals from Midrash Manicures. See my later post with a GALLERY of PHOTOS showing many of my stations. PRIZES: The more thematic, the better. Hanukkah stickers, gelt, candy, dreidels, silly bands, tattoos, Bazooka Hebrew gum, prismatic spinners, bouncey balls, key chains, etc. Good sources are: Benny’s Educational Toys, Jewish Educational Toys, OyToys and Oriental Trading Company. Provide a simple bag for each kid to store prizes. Decorating the bag can be yet another station. Kids who love to color will like this, and the kids who do not love to color can just take the blank bag. Another Toss Tip: Signage. Just a piece of printer paper with the game name in BIG letters is okay. Add a picture so even kids who can’t read will understand. To throw a brown beanbag into a pan is marginally entertaining—even if it’s in a well-marked lane—but if the kids know its called “Latke Toss” (because there is a sign near the target with a picture of a real Latke), it is more fun. Olive and Oil-tasting bar. Video of olive grove / crusher in Israel on DVD while folks eat.